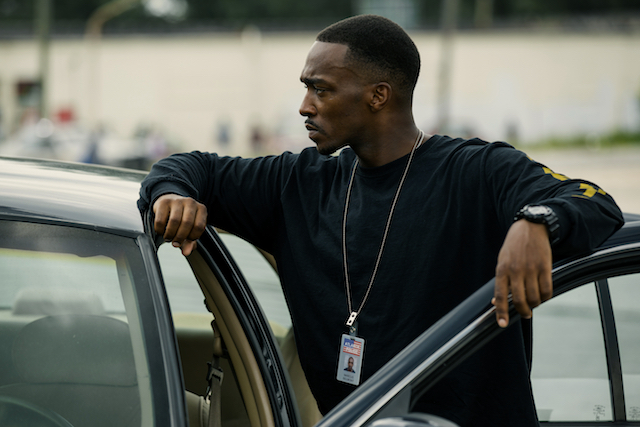 You only need to take one look at the stellar cast assembled for the captivating thriller Triple 9 to become aware of John Hillcoat’s reputation within the industry, as a filmmaker who has earned the respect of audiences and actors alike. The Australian, who thrived within the indelible post-apocalyptic setting of The Road, equally as he did in the past with Lawless – now presents a more contemporary tale, in this intense, nuanced thriller circling a collective of criminals preparing for an ambitious heist. Here he discusses how he first became aware of Matt Cook’s screenplay, what attracted him to getting involved, and what actors such as Kate Winslet and Woody Harrelson brought to this endeavour. How did you come to be involved with this particular project? Anonymous Content develop a lot of scripts themselves, and they represent Matt Cook and he’s a first-time writer, so they brought it to my attention back when I had just finished The Road. 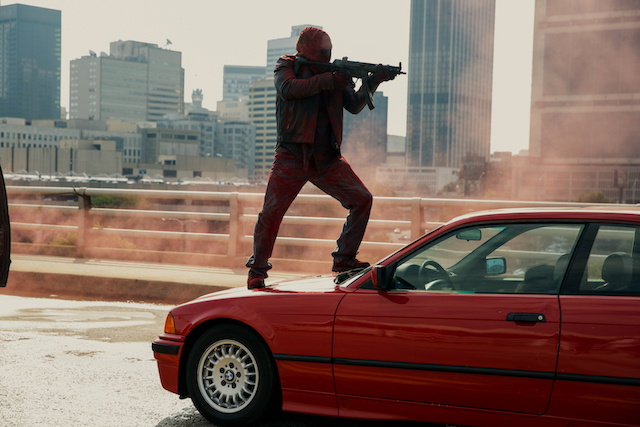 It must be encouraging to know there are untouched screenplays out there with the quality of Triple 9? They might not have been picked up yet – but they do exist. It’s like a needle in a haystack and unfortunately I mainly deal with hay instead of the needle, and a lot of manure. It’s actually a real challenge, especially if you wait for it to come to you – you wait a long time. I’m actually going out and trying to find material to develop myself because I’m getting impatient. So how do you know when a screenplay is right for you? Yeah, it’s a number of things. How rich the characters are, if there are solid enough bones to build in other layers, that’s important, and that it’s fresh. That’s the challenge, because so many screenplays are just referencing everything else. It’s a bit like the internet, this sea of noise. So it’s finding something fresh, dynamic and has rich characters, because I’m not doing animated films, I’m working with actors and the sort of actors I like to work with want to have rich characters. That’s hard to find, and to find good dialogue is hard – it’s a challenge, it’s the hardest thing of all. 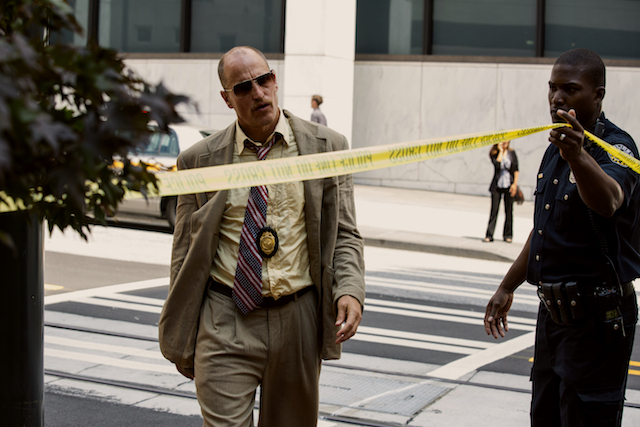 Talking of rich characters, that’s an understatement where this film is concerned – was it one of your biggest challenges to ensure they can maintain the audience’s empathy, despite nearly every single one of them being on the wrong side of the law – which even includes those who initially appear to be on the right side. Nobody is what you expect, there’s every shade of grey. It was a challenge, definitely, but it was also part of what was so great with this ensemble of actors, because they’re all able to brings aspects to their characters which made them more unique and interesting. Matt Cook’s original screenplay has created many moral dilemmas – and I like the antihero. The problem with a traditional hero is that they tend to be two-dimensional. With some characters did you find it was more the actor who brought that, rather than the screenplay? Like Woody Harrelson, his character is not necessarily a bad guy, but there’s an intensity to the actor that means you’re always unsure if you can trust him or not. Absolutely, and it was a real collaboration. For me a script never stops, in preproduction you have the script and you’re putting it together, but when you start casting, it’s like the actor brings the character alive, and then you can tailor it a bit. We created this irreverent aspect to this character who was very reckless and kind of dangerous, a loose canon, shall we say. Woody’s energy was perfect for that and he brought aspects to the film that enriches the character and makes him much more vivid and real. Casey Affleck did the same, through research and asking smart question, and then in postproduction the process keeps going. It’s a non-stop way of constantly getting the right balance and making those characters as rich as possible, basically. Even music and sounds added in post, and associated with certain characters, can then add to their character. Chiwetel Ejiofor, Aaron Paul and Anthony Mackie have all cited you as the main reason they decided to sign up to this project – that must be touching? And they mentioned your accessibility too, is that how you like to work, to allow them more input? Absolutely, sure. We challenge each other and elevate each other. The thing I love about genres is the challenge to elevate them and bring them to life, and that’s what these sort of actors are willing to do. I think also if you ask them to stretch themselves or do something that they haven’t explored, and they see in my work enough detail, and then feel they’re on the same page, and they can have ideas to contribute as opposed to just being a gun for hire, which doesn’t bring out the best of them. So I am looking for that. When casting for a Russian gangster, Kate Winslet isn’t the first name that springs to mind – so what was it about her that convinced you she was right for this part? Well I was looking for a strong, beautiful, smart and powerful woman, and I was looking at different actresses. But I’ll never forget when I saw Heavenly Creatures and her performance is just stunning. So I knew she had this rich emotional range and was really talented, and I also knew that she’d never played a villain. I kind of thought, if you can add that rich, emotional texture to a character and power and precision, imagine putting that into a villain. Villains are often some of the most interesting roles for actors, so I suspected she would like it, but I had no idea how excited she actually was about finally doing this. In regards to the aesthetic, red is a very prevalent colour, which is interesting because the colour blue is generally more often associated to this sort of movie – so was that a deliberate move on your part? Totally. I think it’s because in America blue is the colour of cops, for most of them. But also New York and the chilly feel is all very blue. On the West Coast, Michael Mann went all blue too. So blue has an association with crime, and that’s what made me think, why not red? Especially in Atlanta with the heat and emotional turmoil, and the ancient, primeval associations, like the dye on their hands which is like blood that he’s trying to wash off. Yes – and colour is a very powerful tool. So is sound, so is music. As a filmmaker I feel like those are all the tools that you should utilise. 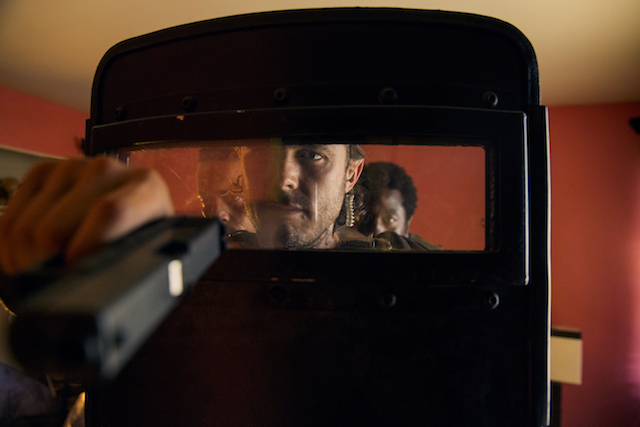 TRIPLE 9 is available on Blu-ray, DVD and Digital now.